Get ready for the biggest test !! Jayamahai Road, Bangalore - 560 006. 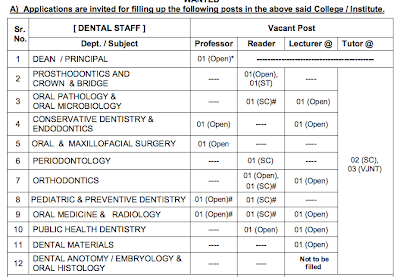 ELIGIBILITY FOR DENTAL SURGERY :- The candidate should be MDS (recognized by DCI) failing which BDS with two years experience in a government organization. Other terms and conditions are same as in the case of other departments. 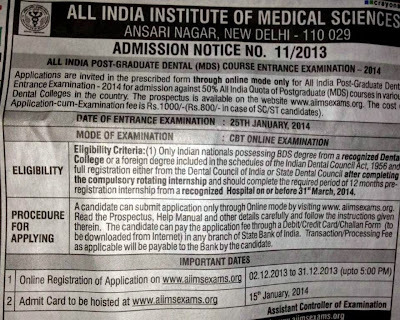 Applications are invited from eligible candidates for All India Common Entrance Test (PIMS-AICET-PG 2014 ) for selection of candidates for admission to Postgraduate Courses in Dentistry (MDS) for the academic year 2014-15 in the constituent colleges of Pravara Institute of Medical Sciences (Deemed University). Qualification for the post of Associate Professor (XI Plan), Department of Orthodontics A BDS Degree of an Indian University or an equivalent qualification with post-graduate qualification/Diplomate of National Board in the subject and with 4 year’s teaching experience after post-graduation.